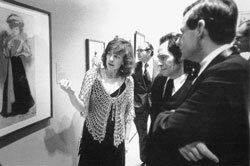 Marilyn McCully with Claude Picasso and William Bowen at the opening of the exhibition Els Quatre Gats. Marilyn McCully has organised a series of pioneering exhibitions focusing principally on Spanish art and the work of Picasso: Els Quatre Gats: Art in Barcelona around 1900 (The Art Museum, Princeton University, and Hirshhorn Museum and Sculpture Garden, Washington DC, 1978-9); Homage to Barcelona: The city and its art 1888-1936 (Hayward Gallery, London, 1985-6, and Palau de la Virreina, Barcelona, 1987); Pablo Picasso: The Artist Before Nature (Auckland City Art Gallery, 1989); The Art of Spanish Posters (Tokyo and Nishinomiya, 1991); Picasso, Painter and Sculptor in Clay (Royal Academy of Arts, London, 1998, The Metropolitan Museum of Art, New York, 1999); Picasso: Scolpire e dipingere la ceramica (Palazzo dei Diamanti, Ferrara, 2000); Il Cubismo: Rivoluzione e tradizione (Palazzo dei Diamanti, Ferrara, 2004); Picasso: Cerámica y tradición (Spanish Pavilion, EXPO 2005 Aichi, and Museo Picasso Málaga, 2005); Picasso Ceramics: The Attenborough Collection (New Walk Museum & Art Gallery, Leicester, 2007); Picasso: Pequeña Figura (La colección en su contexto) (Museo Picasso Málaga, 2007); Devorar París: Picasso 1900-1907 (Van Gogh Museum, Amsterdam, and Museu Picasso, Barcelona, 2011); Kitaj: Portraits and Reflections (Abbot Hall, Kendal, 2011); Picasso's Drawings 1890-1921: Reinventing Tradition (Frick Collection, New York, 2011, and National Gallery of Art, Washington DC, 2012); Picasso Ceramics. Jacqueline's Gift to Barcelona (Museu Picasso, Barcelona, 2012); Monaco Celebrates Picasso: Picasso Côte d'Azur/Picasso in the Nahmad Collection (Grimaldi Forum, Monte Carlo, with Jean-Louis Andral and Michael Raeburn). She has also collaborated on catalogues for Picasso exhibitions in Bern, London, Paris, Washington DC, New York, Antibes, Bergen, Málaga and elsewhere.